Kale, absolutely delicious when bought at the right time and used quickly, is gorgeous in this salad. The kale in this salad is nearly raw, just softened slightly in a dressing made from quickly sauteing Acorn Squash in a bit of olive oil. The caramelized oil left behind is sweet with no added sugars, and becomes the base for the dressing. Although the flavors read “fall” this salad has become somewhat of a staple in my home from fall through late spring; kale is in season here in the fall and spring, but widely available in the store year round. The sturdy squashes like acorn may be a fall staple, but they are long lasting, inexpensive, healthy and vegetables like this can help bridge the gap between the winter and spring vegetables. Hello babies, I’m so happy to see you! Let’s face it, after a long winter we’re all eager to see strawberries, artichokes, asparagus; much of the country, though, in April, is still a long ways away from having those locally, and the ones in the store are still expensive. 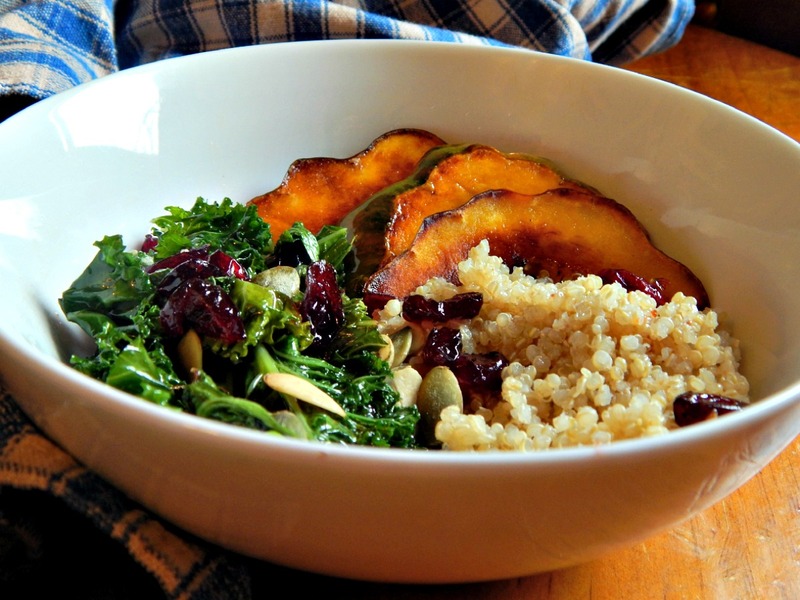 You can’t go wrong, though, with a bright, vibrant and hearty bowl like this one full of Kale, Acorn Squash and Quinoa on a cold, dreary day. Acorn squash, in my mind, is vastly underutilized, the neglected stepchild; butternut seems to always get more attention, but butternut is wonderful in this dish, too. Although not inexpensive to make, this salad is really a meal in itself. Substantial. Life Giving. A Brown rice or another grain would certainly be a bit more cost conscious, but as it is, the Quinoa helps to stand in for the protein in the meal. I won’t begrudge its cost, here. Feel free to adjust the amounts in the dressing or even add a bit of honey. I seem to make this rather loosely, sometimes, based more on whim than actual, precise measurements. I want to note that this recipe wasn’t originally mine – and I wish I remember where I came across this wonderful method of cooking the Squash and making the Vinaigrette right in the pan, as I’d definitely credit the genius who came up with this! I simply had to pass it on, though. A few pumpkin seeds, pepitas or another nut – pecans are wonderful in this. In a large saute pan, add about a tablespoon of olive oil. When heated, add the squash, saute until golden brown and slightly caramelized. Remove and set aside. Take saucepan off heat and add Sherry and Vinegar, stirring. It will bubble and evaporate quickly, so right away, toss in the cranberries and additional olive oil. Taste and add a bit of honey, salt and pepper if desired. Add Kale and toss in the warm dressing with a tongs, using the back of the tongs to press lightly against the kale, slightly bruising it. Leave it in the pan for just a quick minute or two; the goal isn’t to cook it but just slightly tenderize it. Serve in a shallow salad bowl, Quinoa on the bottom, topped with the kale, and the squash to the side. Top with a few pumpkin seeds or nuts of your choice. Drizzle any remaining dressing and cranberries in the pan over the top. This entry was posted in Click here for Bargain Meals, Click here for Fabulous Food Posts and tagged Dried Fruit, Kale, Nuts and Seeds, Quinoa, Salad, Salad Dressings, Squash. Bookmark the permalink.